Halloween is just around the corner. I decided to let you guys all know what costume me and Onur will wear this year! Big surprise: we're both from Star Wars. Remember how last year I was Darth Vader and Onur was a stormtrooper? Well, this year, I am dressing up as Darth Vader's grandson-in-law. Can you guess who? It was Kylo Ren! 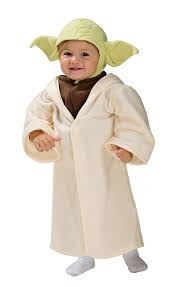 This year, my little brother, Onur will dress up as a wise and old alien Jedi who lives in a swamp and has long green ears (no, I'm not talking about you, Shrek). Yep, it's Yoda! Last year, Star Wars: The Force Awakens was released so it would have made more sense for me to be Kylo Ren, the movie's villain. So instead I'm doing it this year! I have seen commercials for costumes from the upcoming Star Wars movie "Rogue One". This included an Imperial Death trooper and Jyn Erso, which can be seen in the background of a Party City Halloween ad. Maybe I will be a Death Trooper next year. Who knows? I also could have been Darth Vader since he was seen in the trailers for Rogue One, so he will be one of the villains in the movie. Now, it's time to show you some pictures of the costumes! The image above was the closest thing I can find to my costume. 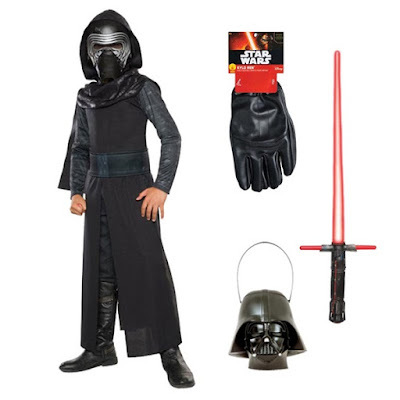 I have all of the items shown in it, except for the Darth Vader trick-or-treating pail. Ours came with everything the kid is wearing, plus gloves. We have a Kylo Ren lightsaber of our own, except that it doesn't light up. It is one of those extendable ones. However, Onur will be using a Luke green lightsaber for his Yoda costume, and that one DOES light up. Note: The image below is the closest thing I could find to Onur's costume. Even though the picture below has a toddler wearing it, his is a bigger version and Onur is NOT a toddler. Okay, I am trusting you that you read the note in big, red letters above. Anyways, Onur's costume is basically like this... Except that: A) the head/ear hat piece has gray hair in the back; B) it includes hand gloves with three finger spaces; C) the robe doesn't go all the way down to his feet, so we has to make him wear brown pants; and the most obvious of all; C) ONUR IS NOT A TODDLER. A post about a new vlog we made on the AABO show YouTube channel that I have not edited and uploaded yet, but I will soon. Expect to see this sometime tomorrow. The Halloween and Day-Before-Halloween Google logos. I always make a post about this on Halloween and days near it since Google prepares a game/something special for the event with their logo every year. 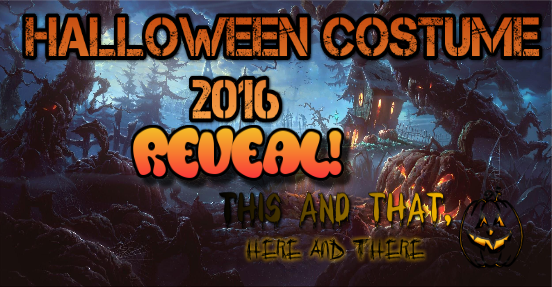 Expect to see this on Sunday (day after tomorrow) and also maybe on Halloween itself. A special post about saying Happy Halloween to everyone, which at the same time is also a trick-or-treating blog post. See this the day after Halloween. And finally, I may or may not give links to some Halloween games and provide a game I coded about Halloween. You may see this sometime soon, in the next few days. I hope you enjoyed this post. Share it with others if you enjoyed it. Remember to view as often as you can, since I am constantly writing and posting new things. Be sure to tell others, and help me get to 20 thousand views before Thanksgiving! We are doing great so far; we are at around 18,600 views! Keep it up! See you next time!!!! BBBBYYYYEEEE!!!!!!! !